I'm very completely obsessed with this necklace since I saw it in some blogs many days ago. Yesterday I went to my nearest H&M shop but I didn't find it! What a pity! I want it desperately!!! Isn't it gorgeous!!?? Gos I LOVE it! Have you seen it? I have already followed you on bloglovin...always I'm following interesting blogs! Btw, yes It' s an amazing necklace! Amazing, reminds me of Tom Binn. Loving ur blog, hope we can follow each other. It is gorgeous! I wish I could help you, but I wouldn't know where to find on or one alike. Maybe on the original blog you found it on? And did I already mention your blog is really pretty? Like, the entire lay-out and header and so on. I really like it! Thanks dear! It's from H&M, but I can't find it.......thanks so much for your lovely comment! omgggggggggg, this is so fab!!!! love first picture! oh I was like you for a couple of days I ago, I mean every blog I open I would see this lovely item.. I just knew that I had to get it, and when I was in store I saw and I decided to get another, just cuz Im so crazy =) hehe but I still love this one, its very unique! Gorgeous is the word!! I hope that you find it or one similar, love the touch of neon green. Thanks ! Wow it's so beautiful ! I love it. Keep those lovely posts coming!! I was just at H&M today and I definitely didn't see it! It reminds me of Dannijo for waaay more! Its is absolutely stunning! 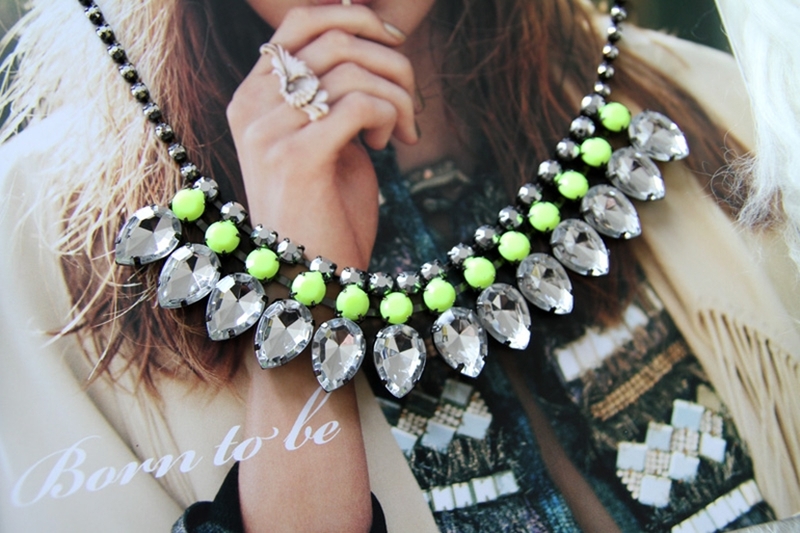 I see something similar on bauble bar..Neon necklaces are so much fun!! beautiful post! Hope you are having a wonderful day! This necklace un just aweeesome !!! Beautiful !! I can see so many possibility to wear it ! I haven´t seen it in H&M but I would love to have one of them! 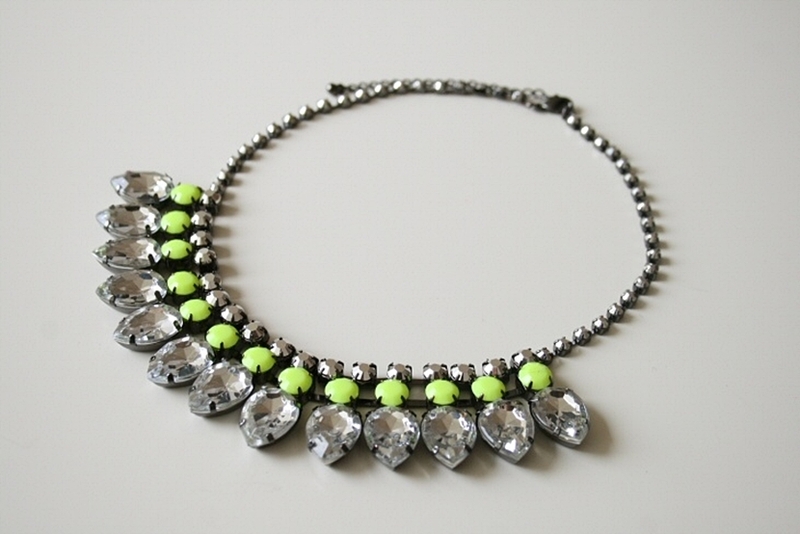 Love this necklace too, adore the neon colors and the giant rhinestones. ah so nice! Love it. ¡¡Qué bonito!! Estoy buscando uno del estilo a ese y los de H&M siempre me terminan enamorando.. Such a gorgeous necklace - seen it in H&M a while back - how I regret not buying it! Silly me!